Poor Luisa Miller (Katia Ricciarelli) has given her heart to a man she knows as “Carlo.” But he is really Rodolfo (Luciano Pavarotti), the son of Count Walter (Paul Plishka), who is being pressured by the Count to marry another woman. 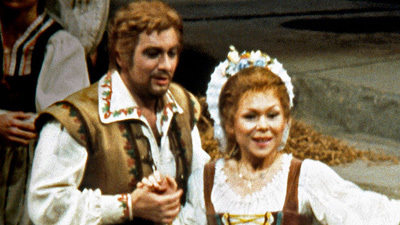 Despite every effort of Lucia’s loving father (Leo Nucci), the evil Wurm (John Cheek), eventually triumphs. But it’s Verdi’s passionate music that wins in the end, brought to life by a cast who knows how to stir our hearts.